Police officers were forced to slow down traffic on the M1 last night following reports of a vehicle travelling in the wrong direction. 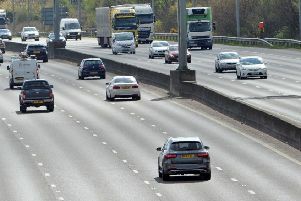 South Yorkshire Police said officers received reports of the vehicle travelling in the wrong direction between junctions 34 at Tinsley and 35 at Thorpe Hesley. They put a 20mph ‘rolling road block’ in place while officers searched the motorway but the vehicle concerned was not located.